A fragment of Ashoka's 6th pillar edict. Indian traders, colonists, military adventurers, Buddhist monks and missionaries brought the Indic script to the countries of South East Asia. From the 16th century onwards Sikhism played a key role in the history of Indian calligraphy. Sikhs have traditionally handwritten their holy book, the Guru Granth Sahib, and furnished it with illumination. Sikh calligrapher Pratap Singh Giani (1855–1920) is known for one of the first definitive translations of Sikh scriptures into English. 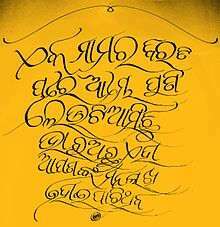 Religious texts are the most frequent vehicle for calligraphy in India. Monastic Buddhist communities had members trained in calligraphy and having shared responsibility for duplicating sacred scriptures (Renard 1999: 23-4). Jaina traders incorporated illustrated manuscripts celebrating Jaina saints. These manuscripts were produced using inexpensive material with fine calligraphy (Mitter 2001: 100). Salomon, Richard. Indian Epigraphy : A guide to the study of inscriptions in Sanskrit, Prakrit, and other Indo-aryan languages. New York, Oxford University Press : 1999. Stevens, John . Sacred Calligraphy of the East. Boston, Shambala : 1995. Anderson, D. M. (2008), Indic calligraphy, Encyclopædia Britannica 2008 . Devanagari script on Omniglot. 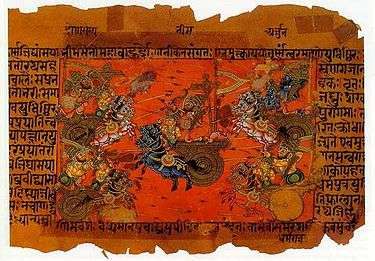 This site also has information on a range of Indian scripts.